The Lake Tahoe Paddle Festival is a solstice celebration of human powered watercraft featuring "Ancient Art to State of the Art™" boats, boards and paddles. Our focus is the preservation of indigenous watercraft art and culture. Interpretive exhibits will highlight sustainable recreation, healthy foods, yoga, healing arts and environmental awareness. The 3rd Annual Emerald Bay Classic paddle race through C'alitaash (Emerald Bay) has been postponed. It symbolizes the preservation of peaceful resolution like the Rapi Nui race of Easter Island. This year’s event will highlight the World Tribe Canoe Project ceremony and starting construction. This 70’ trimaran will be carved by Craftmaster’s from around the World and when completed will sail on tour the Earth educating peoples of the threat to our most precious resource…WATER. Stay connected for all the details. Join us for a weekend of workshops, clinics, fun, food and family entertainment. Try out the world's fastest growing sport—standup paddling—on a demo, or paddle your canoe or kayak over to learn more about protecting Lake Tahoe's clarity and efforts to prevent the proliferation of invasive species. Bring the grandparents and kids to learn about building ancient tule reed boats, dugout canoes or “old school” wood boards. There will be something for everyone in the family. If you've never been out on the water, or you're a SUP professional, the Lake Tahoe Paddle Festival is where you'll want to be to celebrate the summer of 2012. Last year's event featured historic indigenous blessing and closing ceremonies, leaving the audience forever touched. Spectators became participants in board shaping with world-renown Hawaiian craftsman Tom “Pohaku” Stone. 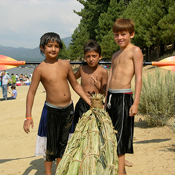 Many long time locals said it was one of the best summer events they had participated in. There were raffles, free boat demos and lots of family fun. 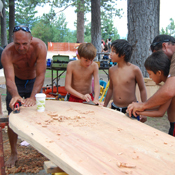 With the Washoe Cultural Society, the South Lake Tahoe Boys & Girls Club as partners, come help support the Mayala Watah Youth Paddle Camp, restore the ancient arts, and check out the state of the art watercraft. 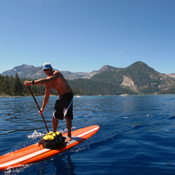 If you've never been out on the water, or you're a SUP professional, the Lake Tahoe Paddle Festival is where you'll want to be to celebrate the summer of 2011.